The Department is equipped with world class infrastructure in order to provide quality education for developing global managers for the India. 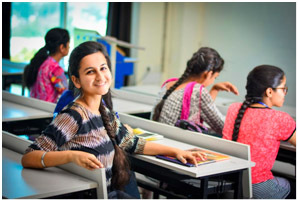 The Department has centrally air conditioned classrooms with ample space. All the classrooms are equipped with LCD Projectors, audio-visual instruments, Boards and computer. Wi-Fi internet facility is available within the classrooms in addition to the charging points for the full class strength of 60 students. All this is aimed at making learning more interesting, meaningful and worthwhile. Two computer labs with capacity of 30 each are available in the Department. All the computers have latest configuration and internet facilities available. Library is stocked with the books of the syllabi, additional books for management subjects, reference books, National and International Journals, periodicals, CD-ROMs, and electronic databases. Computers are available in the library for using e-library. Members of the faculty have their own independent cabins and are provided with laptops that allow them to prepare for their classes well. Office hours of the faculty help increase the teacher-taught liaison.